NOTE: These are often out of stock and have to come from Germany. Please call Vorshlag to check ETA before ordering. The Schroth Enduro 2X2 HANS specific race belt is Schroth's top-of-the-line racing harness for Endurance racing. The Schroth Enduro belt features the widely praised ZIP Adjusters integrated into the lap belt buckle attachments to optimize the position of the adjusters for perfect and fast adjustment. The rotational design of the ZIP Adjusters allows for exceptional ease of adjustment (tightening) and release for faster and smoother driver changes. 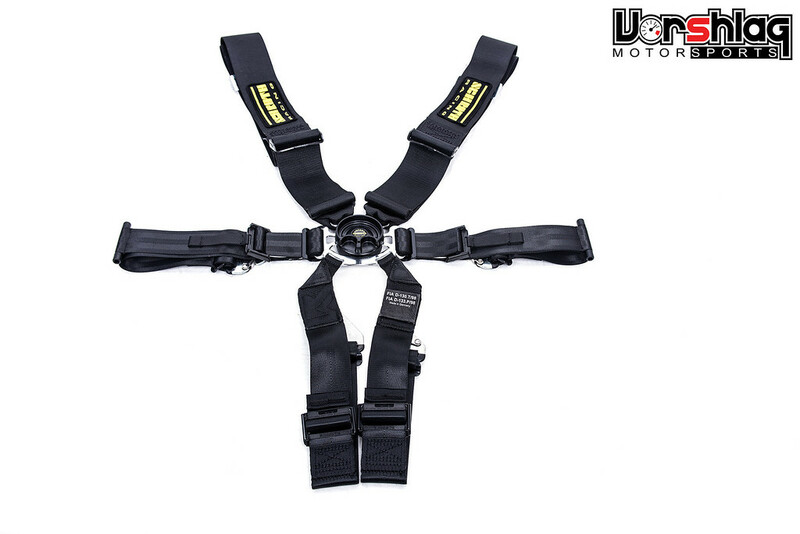 The Schroth Enduro 2X2 6 point harness is designed specifically for when fast driver changes are needed in endurance racing. The lap belt straps have large, easy to grab adjuster loops for the easiest adjustment. Newly designed compact aluminium rotary buckle features a quicker, more positive “click” and an ergonomic release lever. One of the main features of the Enduro 2X2 & 3X2 belt systems is the 2" (50mm) lap belt for added safety over 3" designs. A 2" belt rides within the crest of the human pelvis where a 3" belt would rest on the edges. This allows you to get the belt up to an inch and a half tighter. That means the lap belt will be working earlier in an accident because it gets loaded faster. It's also more comfortable and easier to adjust because there's less friction through the adjuster. Comes with Snap-In attachments at Lap and Sub points. The Shoulders come ready to be wrapped around a roll-bar. Snap or Bolt in attachments can be purchased separately. FIA 8853-2016 Approved. Available in black or red. Choose the appropriate options from the drop down menu at the top of the page. These options can affect the final price shown.